Historically, structural engineers have not been able to incorporate joists with realistic physical properties into their building models. Because of this, joists with non-uniform loading or joists included in a lateral load resisting frames could not be accurately defined. However, recently the Steel Joist Institute (SJI) has developed tables that provide approximate section properties for Virtual Joist and Joist Girder members to be used by the engineer in building models, thus allowing for the members to be designed in a fashion similar to typical steel I-shapes. SCIA Engineer now includes the latest full libraries of Virtual Joist and Virtual Joist Girder cross-sections. Joists can be loaded using simple uniform gravity loads or may have more complex loading scenarios, such as large concentrated point loads or non-uniform snow loads. SCIA utilizes its transparent Design Form technology to assign a realistic designation to each joist and joist girder member based on how the member is loaded. This designation can easily be included in the engineering report and given to the joist manufacturer. Finally, SCIA Engineer has the unique ability design special joists, consistent with expectations from steel joists manufacturers and the SJI. A joist determined to be special, is given a designation which includes the depth of the virtual joist and a diagram showing the actual loading on the joist member. 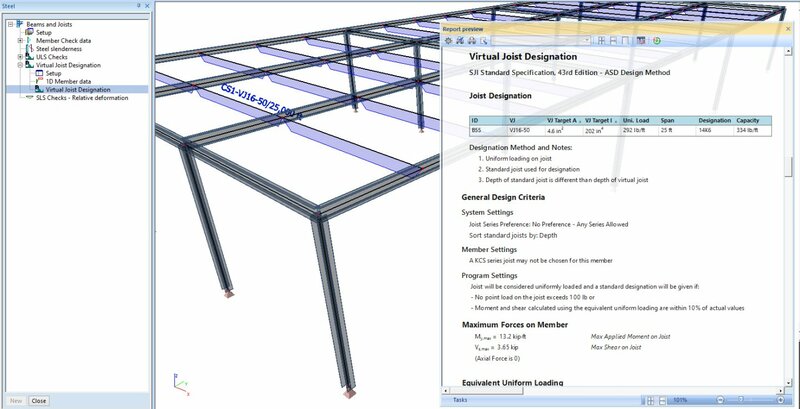 To learn more about the advantages of designing with Virtual Joists and Joist Girders check out the, Virtual Joist article in the SCIA Resource Center or try Virtual Joists yourself by requesting a free trial of SCIA Engineer 16.